I am not much of an "alcohol-drinking" kind of person. I don't get the light-headed, happy feeling that usually a glass of drink should bring. Instead I feel just plain sleepy after a glass of wine. My eyes get heavy and I doze off!! Plonk! Clearly that is not what I want to do, as "dozing off" is something I can do easily even without a drink. What is the point then? I however love cocktails -- Mojito, Margaritas, Mimosas-- Mmmm...so good. Given a choice, I usually tell the bartender to go light on the alcohol part. Defeats the purpose you say? But works for me. I am not sleeping after that drink. And I think I might be feeling a teeny bit happier. But it works best if the husband-man is mixing the drinks at home. He knows my limits and makes the best cocktails that I love. Here are 3 that I am sure you will love too. 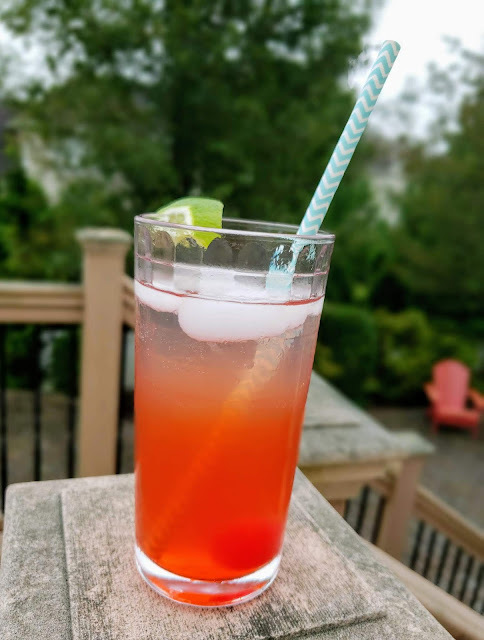 This Singapore Sling which the husband-man had made for my last book club meeting(it is his version of the drink), was a major hit. Our town has a book club and the coordinators take great care to pair the potluck menu at those meetings with the book of the month. Mojito is a summer drink and since we have a huge bush of Mint growing in our backyard, we use all that fresh mint to make ours. 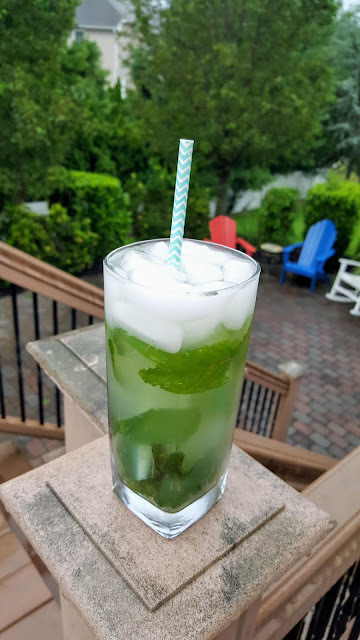 If you can get fresh mint, it is a refreshing drink any time of the year. 2 tablespoons white sugar or 2 tbsp of simple syrup. Place the mint leaves, lime wedges at the bottom of a tall glass or in a cocktail shaker. Add the sugar or simple syrup. Muddle with a Pestle to release the mint oil and lime juice. Add the rum and top off with club soda or sprite. Garnish with fresh mint leaves. I had got a bottle of Limoncello on our trip to Italy earlier this year. I have been waiting for the right time to drink it and never found the "right-time". The husband-man used it to make another amazing cocktail which will be on the drink list tomorrow. 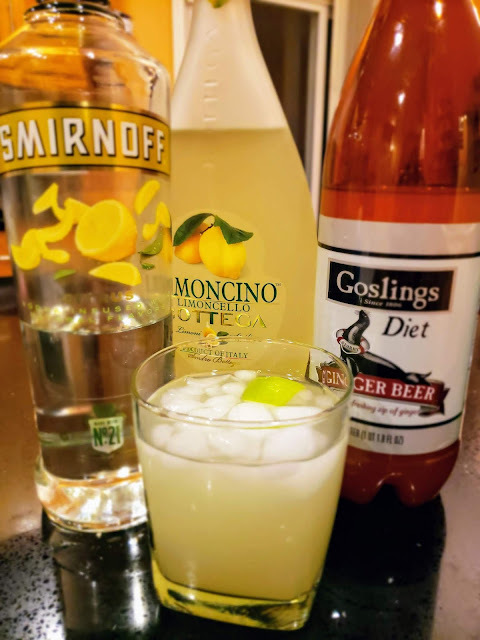 Add the limoncello, vodka, lemon juice, to a cocktail shaker. Shake shake shake. Pour into glass. Add Ginger Beer to the top of drinks and stir. Garnish with Thin rinds of lime. Here's to a happy looking back to 2018 and fizzy welcome to 2019!